update on the references experiment. references were turned on during this test period. on the period between 200.10.03 to 2009.07.10 I got 14 requests, in fact lower than when I had hidden references, which contradicts the initial hypothesis of lowering rates of request. it was a common case of confirmation bias. we might be seeing just seasonal change (i.e., colder weather, less people requesting). 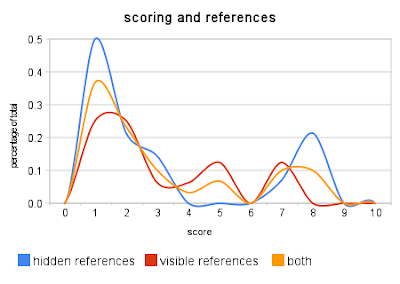 what's interesting, and confirmed my hypothesis on "play it safe" guests are the distributions of scores obtained. by hiding references I effectively am "pushing" the distribution to be more contrasting as demonstrated by the graph below. meaning: I do not get average requests. I get either very good or very bad. and very good requests mean very nice people. sample size is 30 (14 visible references, 16 invisible references). I will continue to log and map these and publish weekly. again I should mention that the score is correlated with the quality of stay and mainly a measurement of both intelligence and selflessness. this is still not formalized in numbers but hopefully it will in the future. current threshold for accepting guests is 6 or greater and has led to a much nicer mood in general.